It's 5:15AM as I write this. A few minutes ago, after the kid woke us for his breakfast, I walked to the kitchen to fetch a glass of water. When I arrived at the sink, I looked up and saw the most amazing thing: Hale-Bopp, the comet, brighter than any star, hanging from the Northeast sky over San Francisco Bay. I've seen five comets in my life. None have been more spectacular than this one is, right now. It's astonishing. Trust me: this one is a Star of Bethlehem-grade mother of a comet. Considering the comet's quality, publicity has been kind of weak. Which makes sense, since I have noticed an inverse relationship between comet quality and notoriety. In fact, Kahoutek was such a big no-show that when Comet West appeared in 1975, it received almost no publicity at all. But it was a wonderful comet. First it appeared as a morning star with a bright little tail about one moon long, above the Eastern horizon. Then, after it whipped around the Sun and flew back out toward its own tail, the comet spread into a wide V that graced the evening sky like God's own logo. At the time I lived in a rural enclave outside Chapel Hill, North Carolina, and every night for several weeks a few of us would wander out and marvel at the show. The next comet was Halley, in 1986. Astronomers had rightly mixed feelings about Halley. On the one hand, they knew this would be one of Halley's least visible visits. On the other hand, they knew it would raise interest in astronomy. Well, Halley was nearly as big a bust as Kahoutek. At best the "Great Comet" was a tiny smudge in the sky. Can you see it in this picture? Right. My friend Jerry Solfvin and I had about the same luck when we joined a 3AM traffic jam of about 10,000 people who went to the far side of Mt. Diablo to look at this. By the way, this picture is from the Hyuktuke Gallery at the NEFAS (Northeast Florida Astronomical Society) site. Comet Hyuktake showed up about a year ago, and enough time had passed since the Halley disappointment to allow the new comet a fair measure of publicity. And Hyuktake was a beauty. When it skirted the North Star, the comet's tail stretched across a sixth of the sky. The best image I've found is this cool 3-D number by Dave Crum. Click on it to visit a larger version at the NEFAS site. And now we have Hale-Bopp. 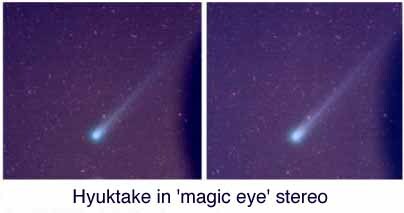 Although Hale-Bopp won't come nearly as close to Earth as Hyuktake did, it's putting on a bigger show, mostly because it's a bigger comet. A lot bigger. This thing is more than 200 times larger than Halley: about 40km across. You can actually see some shape to it, even with the naked eye. To spot it, look to the Northeast in the early morning, when it's still dark. You'll see it below and to the left of Cygnus (the Northern Cross), pointing straignt down toward the horizon. It'll be brighter than any other star in the sky, and with a tail that stretches across the Milky Way. On the 6th you'll also see the last sliver of moon down to the East, and on succeeding days the moon will move out of the way long enough for a great view. Finally, let's not forget the kid, who was born between Hyuktake and Hale-Bopp. In this context the miracle of his arrival (to parents our age) seems almost ordinary. And don't miss it. This may be the last comet you ever see.